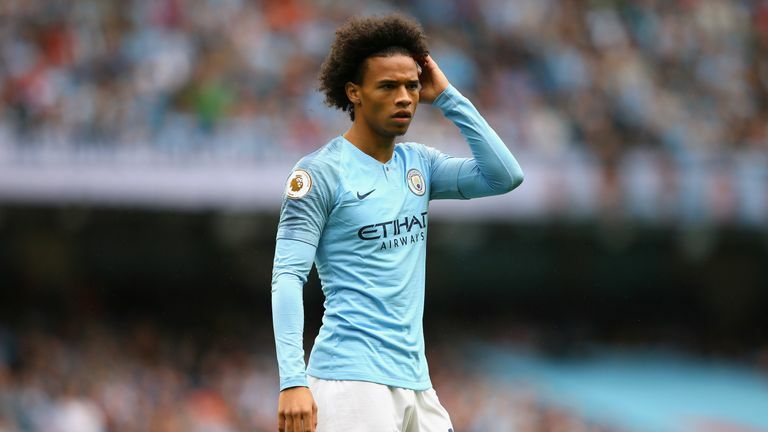 Pep Guardiola has dismissed suggestions he is unhappy with Leroy Sane's attitude after he was dropped for Manchester City's victory over Newcastle on Saturday. Germany international Sane was missing from City's matchday squad as goals from Raheem Sterling and Kyle Walker secured a 2-1 victory that moved the champions to within two points of leaders Liverpool and Chelsea. Sane had started all of City's three previous league games on the bench but reports before Saturday's game claimed Guardiola was concerned by the winger's focus in training. However, speaking after the Newcastle win, the City boss offered an explanation for Sane's omission. "Last game Phil Foden was not in the squad," Guardiola told his post-match press conference. "I was so sad with Phil as I am with Leroy now. "We have six strikers and I decided to play with two strikers, we have two wingers plus another one on the bench. "That's why we decided this game he wouldn't be there. In the next games he will be ready to play. "He played 10 minutes [against Wolves], he tried. He was not precise but he tried. "They convince me, I am satisfied from the moment they run. Mistakes without the ball, taking decisions is part of the process." Guardiola was then asked if he was completely happy with Sane's attitude, on and off the pitch, and the manager replied: "Yes."